Most good hair stylists are insanely busy. You’ve probably had times when you’ve had trouble booking an appointment with your stylist. They might say, “I’m not sure if that slot’s open,” “I’m away from my appointment book,” or worse, accidentally double-book you. Then you both have to face disappointment when they call to cancel later. We created Ring My Stylist specifically to avoid this issue. It’s so easy to book a no-problem appointment with the app. Your stylist doesn’t need a receptionist, you don’t have to leave a message, and you don’t have to play 20 questions with them to find out when they have an open slot that matches your schedule. In fact, you don’t have to talk to them at all when you’re both using the app. 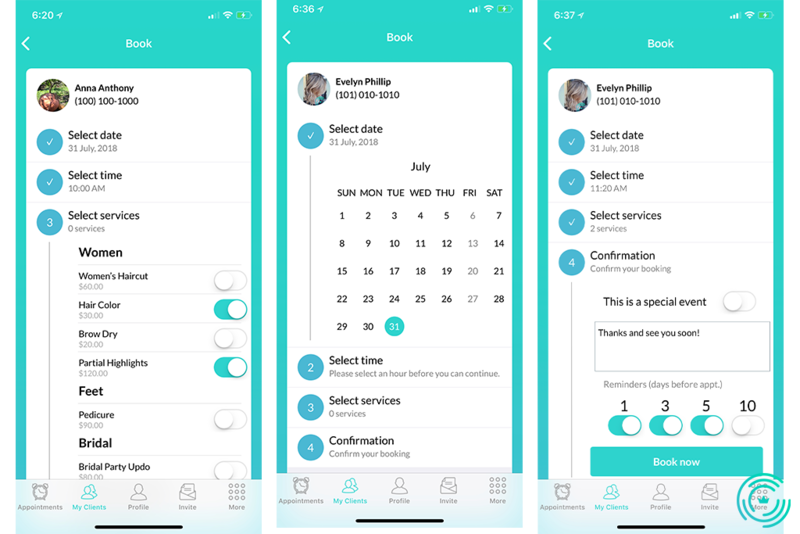 You connect directly with their Ring My Stylist appointment book on your smartphone, and look over their schedule for an opening that works. In fact, you’ll only be able to see the openings; the rest of their schedule is hidden. Just select a date, time, and type of service, and you can claim it on the spot. You both get a notification that it’s set. If you need to, you can easily cancel your original appointment, and pick another, later appointment. On your stylist’s end, all they have to do is Confirm or Cancel. Once they Confirm, you’re good. No fuss. No muss. No hassle. Bingo—you’ve got your appointment, and it takes a fraction of the time that scheduling an appointment usually takes. You can even set reminders so you don’t forget!